Eric Sporel at the monument he created in Westford. On Memorial Day, after a special morning Mass for veterans at St. Catherine of Alexandria Cemetery in Westford, parishioners can visit a new fixture on the cemetery lawn — the Veterans Memorial Garden. “This meant a lot for me to do. 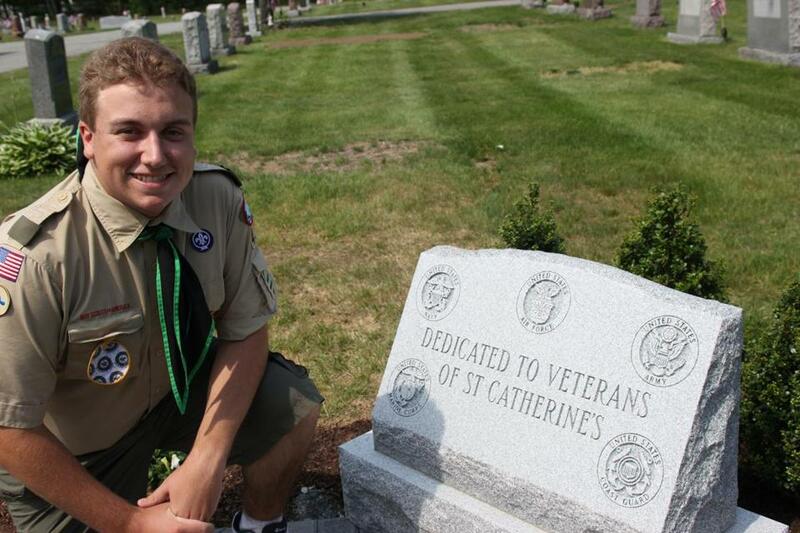 This is a way for me to thank veterans of my church, but also all veterans,” said the Westford Academy junior, 17. Sporel, who holds a life rank in scouting, built the memorial for his Eagle Scout service project, an opportunity for older Scouts to demonstrate leadership while providing a service for an institution in the community. He said he chose this particular project because it combines his appreciation for his church and recognition for former service members, some of whom frequent the soup kitchen where he volunteers. Memorial Day parades and commemorations throughout the region. Sporel added that the memorial is also meant to remind civilians of the sacrifices made by those in the armed forces. “I want them to be thankful for veterans for doing what they do,” he said. In line with the requirements of an Eagle Scout project, Sporel has solicited help and donations from family, friends, and localbusinesses since he began in September. He also enlisted other Scouts and fellow National Honor Society members from his high school to assist with the physical labor. Sporel said that in addition to local businesses offering materials and discounts for the memorial garden, he has gotten support from several key individuals along the way. He said he is especially thankful to cemetery manager David LeBleu, who helped to get the project approved by cemetery officials, and Ellin Hanlon, who offered design advice for the flower bed. Sporel also expressed thanks to fellow churchgoers who have volunteered to help maintain the garden. “I’ve had a couple people who are parishioners and offered to water the flowers.” he said. Although the opening of the garden wasn’t necessarily meant to coincide with Memorial Day, Sporel said he was happy about the timing. “I want our veterans to know that they are appreciated,” he said.